* AFTER first visit: click link & "REFRESH" for updated time. See an Unexplained Object in the Sky? Walsh, Glenn A. "Zeiss to be Reassembled: Science Center Announcement." News Release. Friends of the Zeiss 2009 Aug. 18.
displayed in Carnegie Science Center atrium by late 2010. Mercator's Projection Map of the World from the original Buhl Planetarium building. to teach science to children visiting the Children's Museum. Pittsburgh Post-Gazette 2002 Dec. 30. Regarding proposed "Final Frontier" exhibit. McCoy, Adrian. "Science Center's 'roboworld' displays real and famous robots in traveling exhibit." Pittsburgh Post-Gazette 2009 June 14. Baillie, Ronald J. and Ann M. Metzger. "Robots R Us, Robotics play a key role in Pittsburgh's present and future." Op-Ed. Pittsburgh Post-Gazette 2009 June 10. Ronald J. Baillie and Ann M. Metzger are co-directors of The Carnegie Science Center. Machosky, Michael. "Carnegie Science Center adds Roboworld to permanent exhibits." Pittsburgh Tribune-Review 2009 June 10. * Walsh, Glenn A. "Science Center Space Lost for Display of Planetarium Artifacts." Address. Pittsburgh City Council. 2008 April 29. Address. Board of Directors, Allegheny Regional Asset District. 2008 April 28. * Graham, Francis. " Science Center Space Lost for Display of Planetarium Artifacts." Letter. To City and County Public Officials. 2008 April 24. * "CMU'S ROBOT HALL OF FAME." * Templeton,, David. "Robots coming to life in 2009 exhibit." Pittsburgh Post-Gazette 2008 April 10. * Houser, Mark. "Roboworld could cement 'Burgh as robotics capital." Pittsburgh Tribune-Review 2008 April 10. * Houser, Mark. "Robot exhibit coming to Carnegie Science Center." Pittsburgh Tribune-Review On-Line 2008 April 9. * "Carnegie Science Center will open comprehensive robotics exhibition." Pittsburgh Tribune-Review 2008 April 7. * Houser, Mark. "CMU at forefront in building thinking machines." Pittsburgh Tribune-Review 2008 April 6. * "What is artificial intelligence?." * "Will A.I. work lead to robots taking over the world?" * Houser, Mark. "Robots do a little networking." Pittsburgh Tribune-Review 2008 April 9. * 2008 Feb. - Recent News of Controversy Regarding "Bodies...the Exhibition"
by the ABC-TV news show "20/20." Pittsburgh's original Buhl Planetarium and Institute of Popular Science. Pittsburgh Post-Gazette 2008 March 29.
published in the Pittsburgh Post-Gazette on 2008 January 1. Pittsburgh Post-Gazette on 2008 January 5. Regarding BOTH Carnegie Library and Buhl Planetarium. warehouse where historic Buhl Planetarium artifacts are currently in storage. planetarium projector in the world !!! first publicly-funded Carnegie Library, Carnegie Free Library of Allegheny. Buhl Planetarium and Institute of Popular Science. spare parts for a similar exhibit at the Health Museum of Cleveland. was reached, which assures continued use of the Science Center observatory. and original Buhl Planetarium and Institute of Popular Science. Fare Increase Effective 2008 January 1. Artist known for his paintings of Western Pa. woodlands." Pittsburgh Post-Gazette 2009 Oct. 9.
the Charles Pitcher Gallery in Shadyside from 1970-73." Shalaway, Scott. "Volunteers wanted for Lost Ladybug Project." Column. on the History of Buhl Planetarium Web Site. Shalaway, Scott. "Get Into Nature: Citizen Science and the Lost Ladybug Project." Column. Olson, Thomas and Kim Leonard. "Pittsburgh Opera joins city's 'green' renaissance with renovated building." Pittsburgh Tribune-Review 2009 July 21: A1. Leonard, Kim and Thomas Olsen. "Pittsburgh Opera building to go green." Pittsburgh Trib p.m. 2009 July 21: 4. Articles included listing of "Green Geezers,"
obtain LEED (Leadership in Energy and Environmental Design) certification. George Westinghouse first built railroad locomotive air-brakes) will join this list. A Personal Remembrance From 40 Years Ago." History of Buhl Planetarium Web Site 2009 July 20. Erdley, Debra. "Pittsburgh pegs zoo, Aviary, Phipps' free water use at $500,000." Pittsburgh Tribune-Review 2009 June 24. Buhl Planetarium never enjoyed free water service. French, Sue. "As the Crow Flies." Column: Deep Sky Wonders. Sky and Telescope Magazine 2009 May: 48. Eric G. Canali cited for asterism "Canali" (a.k.a. "Canali's Cluster"). yellow, pale yellow, yellow, and gold. Institute of Popular Science and New York City's original Hayden Planetarium. Baltimore, Chris. "Obama quizzes astronauts about life in space." O'Driscoll, Bill. "Taking It Outside." Pittsburgh City Paper 2009 Feb. 26. "Falling leaves in February at Children's Museum exhibit." Pittsburgh Post-Gazette 2009 Feb. 7. Gormly, Kellie B. "Get to know nature inside out at Children's Museum." Pittsburgh Tribune-Review 2009 Feb. 5. Lowry, Patricia. "City's Friendship Quilt back for show." Pittsburgh Post-Gazette 2009 Jan. 24. SportsWorks/warehouse building, after being unseen for 20 years. Quilt includes quilt strip dedicated to original Buhl Planetarium Observatory. Belko, Mark. "Buhl Building signs its first tenant." Pittsburgh Post-Gazette 2008 Dec. 4. "Panel OKs Buhl Building restoration." Belko, Mark. "Buhl Building rehab unveiled." the Buhl Foundation after the death of Henry Buhl, Jr.
Lowry, Patricia. "Buhl Building ready for its closeup." Pittsburgh Post-Gazette 2008 July 4.
ten years earlier), whose Buhl Foundation built Buhl Planetarium in 1939. "Space tourist returns from $30M orbital trip." "Expedition 17 Crew Returns From International Space Station." Walsh, Glenn. "Fw: New Crew Blasts Off for International Space Station." E-Mail List Message. South Hills Backyard Astronomers 2008 Oct. 13.
of dedication on 2008 Oct. 24. Walsh, Glenn. "Historic Plaque Erected on Buhl Planetarium." E-Mail List Message. Mentions architectural tours of the Buhl Planetarium and old Allegheny Post Office. "Planning commission OKs several requests." Pittsburgh Post-Gazette 2008 Sept. 24. Boren, Jeremy. "Panel approves South Side restaurant." Pittsburgh Tribune-Review 2008 Sept. 24.
on their expansion of the Science Center building. Walsh, Glenn. "Science Center Master Plan: Siderostat Observatory Missing." Address. Pittsburgh City Planning Commission. 2008 Sept. 23. "Astronaut's son spending his fortune to fly." McClelland, Clark C. "A past Space Shuttle ScO, admits ET's are Real. And this ScO has seen them, himself with another witness!" Buhl Planetarium, for several years in the middle of the twentieth century. "Ex-Astronaut: Aliens Are Real and NASA Knows It." FOX News 2008 July 24. Dr. David M. Hillenbrand. 2008 April 9. Pittsburgh City Paper 2008 March 19.
for their transparent woman exhibit. * Walsh, Glenn A. "Response to Personal Attack in Post-Gazette." Address. Allegheny County Council. 2008 March 18. Response of Glenn A. Walsh to personal attack in "Belated opposition"
both Carnegie Library and Buhl Planetarium. Address. Pittsburgh City Council. 2008 March 18. Address. Board of Directors, Allegheny County Library Association. 2008 Feb. 18. * Rothstein, Edward. "Planetarium Review, Looking at the Stars From Angles Old and New." The New York Times 2008 Feb. 16. ** Zapadka, Pete. "Space shuttle commanded by Richland grad lifts off." Pittsburgh Post-Gazette On-Line 2008 Feb. 7. ** "NASA was anxious to get Atlantis flying." Pittsburgh Tribune-Review/AP 2008 Feb. 8.
which begins at 1:00 a.m. EST (interview will probably occur 2:00 to 5:00 a.m.). In Pittsburgh, the interview can be heard on WPGB-FM 104.7 MHZ and WPTT-AM 1360 KHZ. Des Moines, Philadelphia, New York, Chicago, Albany, Louisville, and Youngstown. "Snowballs on Summer Solstice Day" promotion (from 1985). Science, and the historic Zeiss II Planetarium Projector. granted to the library systems' Electronic Information Network. flight engineer on the International Space Station during Expedition 9. Walsh, Glenn A. "A Brief History of Analog Television Broadcasting in Pittsburgh." History of WQEX-TV 16 Web Site 2009 July 24. Walsh, Glenn A. "Sighting Opportunities -- International Space Station." History of Buhl Planetarium Web Site 2009 July 6. Walsh, Glenn A. "Citizen Science Projects." History of Buhl Planetarium Web Site 2009 June 9. Buhl Planetarium and Institute of Popular Science." History of Buhl Planetarium Web Site 2009 May 22. History of Buhl Planetarium Web Site 2009 May 20. History of Buhl Planetarium Web Site 2009 May 13. And Annual Workshop Exhibit at Buhl Planetarium." History of Buhl Planetarium Web Site 2009 March 14. Walsh, Glenn A. "Art in Pittsburgh�s Original Buhl Planetarium." History of Buhl Planetarium Web Site 2008 April. History of Buhl Planetarium Web Site 2008 Jan.
Current Use of Building by Children's Museum." History of Buhl Planetarium Web Site 2006 March. A Personal Remembrance From 20 Years Ago." History of Buhl Planetarium Web Site 2006 Jan.
History of Buhl Planetarium Web Site 2005 June 3. "Circumference: Eratosthenes and the Ancient Quest to Measure the Globe." New York: St. Martin's Press, 2008. Pp. xi, 223. ISBN 9780312372477. $23.95. Marchant, Jo. "Review: Time in Antiquity by Robert Hannah." New Scientist Magazine 2009 Jan. 28. Pelling, Nick. Review of �The Long Route to the Invention of the Telescope." Did a sixteenth-century heretic grasp the nature of the cosmos?" The New Yorker Magazine 2008 Aug. 25. "400 Years of the Telescope." Knoll, Corina. "Founders fear Stony Ridge Observatory might be lost in Station fire." Blog: L.A. Now. Los Angeles Times On-Line 2009 Sept. 2. Johnson Jr., John. "Fire forces scientists to halt research at Mt. Wilson Observatory." Los Angeles Times 2009 Sept. 2. Malik, Tariq. "Trash in Space May Force Shuttle, Station to Dodge." Adegoke, Yinka and Alexei Oreskovic. "YouTube may stream movie rentals." The Washington Post On-Line 2009 Sept. 2. Dunn, Marcia. "Space shuttle blasts off, finally flying on try 3." Pittsburgh Tribune-Review/AP On-Line 2009 Aug. 29. "NASA's Shuttle Discovery Launches to Enhance Space Station Science." Kalson, Sally. "City's ToonSeum growing up." Pittsburgh Post-Gazette 2009 Aug. 29. Emerging Pittsburgh Cartoon museum expanding beyond Children's Museum. Hoag, Christina. "Calif. firefighters wage fierce wildfire battles." Altadena were likely to see flames, said U.S. Forest Service spokesman Stanton Florea. "NASA Selects 16 Small Business Research and Technology Projects." Borenstein, Seth. "To the moon, NASA? Not on this budget, experts say." Spatter, Sam. "CCAC to build $20 million science building on North Side." Pittsburgh Tribune-Review 2009 Aug. 26. Cronin, Mike. "Carnegie Mellon scientists' software a step to treating complex diseases." "Flashback to Neptune's Moon Triton." Jet Propulsion Laboratory/NASA 2009 Aug. 25. "NASA Sets New Target Launch Date for Space Shuttle Discovery." Dunn, Marcia. "NASA preps space shuttle for early morning launch." Rao, Joe. "Space Shuttle Launch Visible from East Coast." "Mars rover still stuck in Martian sand." Pawlowski, A. "What's a planet? Debate over Pluto rages on." Grossman, Lisa. "Landing sites on Europa identified." New Scientist Magazine 2009 Aug. 24. O'Brien, Jeffrey M. "First electric cars, now electric planes." Blog: Brainstorm Tech. CNN/Fortune Magazine On-Line 2009 Aug. 24. Null, Christopher. "It ain't poltergeists: Cell phone activates oven." Blog: The Working Guy. Boitard, Catherine. "Fires rob pollution-choked Athens of fresh air filter. Choi, Charles Q. "The Appendix: Useful and in Fact Promising." Burns, Judith. "Upwards lightning caught on film." "Why Sleep? Snoozing May Be Strategy To Increase Efficiency, Minimize Risk." Science Daily 2009 Aug. 23. "NASA To Air Stephen Colbert Message On Eve Of Shuttle Launch." Beatty, Kelly. "Jupiter's Impact: Gone in 30 Days." Sky and Telescope Magazine On-Line 2009 Aug. 21. X-Ray Observatory in space still providing good science. "NASA Launches New Technology: An Inflatable Heat Shield." "We have a 'right to starlight,' astronomers say." Barry, Patrick. "In Search of Antimatter Galaxies." Britt, Robert Roy. "Strong Meteor Shower Expected Tonight." Hsu, Spencer S. and Cecilia Kang. "U.S. Web-Tracking Plan Stirs Privacy Fears." The Washington Post 2009 Aug. 11. Johnson, Carla K. "Aspirin shows promise for colon cancer patients." Phillips, Dr. Tony. "Horse Flies and Meteors." Regarding upcoming Perseid Meteor Shower, Aug. 11-13. "Meteorite Found On Mars Yields Clues About Planet's Past." Klotz, Irene. "NASA wants proposals for space taxis." Moskowitz, Clara. "Two Worlds Collide in Deep Space." "Optimistic Women Live Longer, Healthier." of medicine at the University of Pittsburgh. Lin Erdman, Shelby. "Kepler telescope makes quick discovery." Specialty Steel's Production of Space-worthy Alloy." "NASA'S Orion Spacecraft Makes Stops During Florida-Texas Trek." "Lack of Vitamin D in Children 'Shocking'." David, Brian. "Obituary: Michael Eversmeyer / Architect worked to save historic Pittsburgh buildings." Pittsburgh Post-Gazette 2009 Aug. 3. "Vitamin D may live up to hype." Pittsburgh Tribune-Review/AP 2009 Aug. 2. "Mysterious bright spot found on Venus." New Scientist Magazine On-Line 2009 July 29. "Astronaut tool bag to drop on earth." Deccan Chronicle On The Web 2009 July 29. Dunn, Marcia. "Shuttle undocks after 11 days at space station." "NASA Honors Apollo Astronaut Al Worden With Moon Rock." The Houston Chronicle 2009 July 28. "Save Swine Flu Drugs for Younger Patients, Study Urges." Krebs, Brian. "'Smart Grid' Raises Security Concerns." The Washington Post 2009 July 28. Vogel, Carol. "Stripping Away the Darkness as Murals Are Reborn." The New York Times 2009 July 26. Kardel, Scott. "Lost History?" Blog. Palomar Skies 2009 July 25. Naeye, Robert. "Clouds Part for Solar Eclipse." Sky and Telescope Magazine On-Line 2009 July 22. Sky and Telescope Magazine On-Line 2009 July 20. Phillips, Dr. Tony. "Longest Solar Eclipse of the 21st Century." Total Eclipse of the Sun - Visible in India, China, Pacific Ocean. SAFE WAY TO VIEW SOLAR ECLIPSE. Are �hand-made� or �home-made� solar filters or eclipse-viewing glasses safe to use? MacRobert, Alan. "Apollo Landers Seen on the Moon." Sky and Telescope Magazine On-Line 2009 July 17.
artifacts, while loaning artifacts to The Carnegie Science Center. Written statement of Glenn A. Walsh to members of Allegheny County Council. Do you support the county donating Lincoln�s artifacts to the Heinz History Center? UFO incident occurred in suburban Pittsburgh. Including playhouse (with photo) designed to look like original Buhl Planetarium. removed for large window highlighted in Feb. 22 column. make your snowball as soon as you can!" Reuse of original Buhl Planetarium promotion from mid-1980s ! effective 2007 June 24, Fare Increase effective 2008 Jan. 1.
effective 2007 June 17, Fare Increase effective 2008 Jan. 1. * Sat., Oct. 31/Sun., Nov. 1/Mon., Nov. 2 - Traditional Astronomical Cross-Quarter Day Samhain or "All-Hallowsmas", better known as Halloween (Oct. 31 - "All Hallows Eve"), All-Saints Day (Nov. 1), All-Souls Day (Nov. 2) [fourth and last traditional cross-quarter day of year); actual cross-quarter day. What is a "Cross-Quarter Day" ? * Sun., Nov. 1, 2:00 a.m. EDST - DAYLIGHT SAVING TIME ENDS - Change in Federal law thus that return to Standard Time occurs 2:00 a.m. EDST (which becomes 1:00 a.m. EST) on Sunday, November 1. * Sun., Nov. 1, 3:00 a.m. EST - Mars 0.05 degree south of Beehive Star Cluster (M44). * Sun., Nov. 1, 9:00 p.m. EST - Venus 4 degrees north of Star Spica. * Mon., Nov. 2, 2:14 p.m. EST - Full Moon (Hunters' Moon or Beaver Moon). * Wed., Nov. 4, 12:00 Midnight EST - Moon 0.02 degree south of Pleiades Star Cluster (M45). * Thur., Nov. 5, 3:00 a.m. EST - Mercury in superior conjunction with Sun (Mercury not visible). * Fri., Nov. 6, 6:00 a.m. EST - Moon 0.9 degree north of M35 Star Cluster. * Fri., Nov. 6, 1:59 p.m. EST - Double-shadow (shadows of 2 Galilean Moons) transit on Jupiter; visible, with difficulty, through telescope. * Sat., Nov. 7, 1:42 a.m. EST - Actual Astronomical Cross-Quarter Day Samhain or "All-Hallowsmas" (fourth and last actual cross-quarter day of the year); also see traditional cross-quarter day. * Sat., Nov. 7, 2:00 a.m. EST - Moon at perigee: 368,903 kilometers. * Mon., Nov. 9, 1:00 a.m. EST - Mars 3 degrees north of Moon. * Mon., Nov. 9, 10:56 a.m. EST - Last Quarter Moon. * Thur., Nov. 12, 8:00 p.m. EST - Saturn 8 degrees north of Moon. * Mon., Nov. 16, 2:14 p.m. EST - New Moon: Lunation 1075. * Tue., Nov. 17 - Mercury at aphelion. * Sun., Nov. 22, 3:00 p.m. EST - Moon at apogee: 404,733 kilometers. * Mon., Nov. 23, 5:00 p.m. EST - Jupiter 4 degrees south of Moon. * Tue., Nov. 24, 4:39 p.m. EST - First Quarter Moon. This Internet, World Wide Web Site is dedicated to the history of a pioneer in the fields of planetaria and informal Science education for the public: The Buhl Planetarium and Institute of Popular Science in Pittsburgh, Pennsylvania U.S.A. Most people referred to the entire institution as simply "Buhl Planetarium" [except from 1982 February through 1991 August, when it was known as the Buhl Science Center]. This should not be confused with the Henry Buhl, Jr. Planetarium and Observatory, located in Pittsburgh's Carnegie Science Center, which is also sometimes referred to as "Buhl Planetarium." The Buhl Planetarium and Institute of Popular Science was the fifth major planetarium erected in the United States. The original Buhl Planetarium includes a Zeiss Mark II Planetarium Projector, now the oldest operable, major planetarium projector in the world ! And, this was the first planetarium projector in the world to be placed on an elevator, a fairly unique "worm-gear" elevator custom-built by Pittsburgh's Westinghouse Electric Company, for greater flexibility in the "Theater of the Stars." The Planetarium Theater was also the first in the world to include a stage for theatrical performances ! The original Buhl Planetarium also includes a rather unique telescope specifically designed for public viewing, although constructed at professional observatory standards. The 10-inch "Siderostat-type" Refractor Telescope, dedicated by famous Astronomer Harlow Shapley in 1941, allows the public to view celestial objects from a warm observing room, during the cold-weather months! This telescope is the world's second largest operable Siderostat-type telescope ! The exterior of the building is constructed of Indiana Limestone, with much of the interior walls[and the Foucault Pendulum Pit] composed of Florentine Marble. In the first floor's Great Hall is a large map of the world, originally created by the United States Maritime Commission for the 1939 World's Fair in New York City. At the time of creation, it was considered the largest Mercator's Projection map in the world ! The original Buhl Planetarium, which was dedicated 1939 October 24, closed as a public museum on 1991 August 31. It continued to be used as a tutorial center for The Carnegie Science Center's Science and Computer classes until 1994 February. The building and historic equipment have not been used for the benefit of the public since 1994. 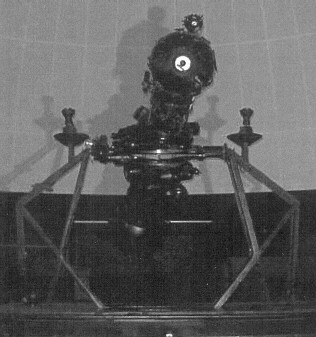 The historic Zeiss II Planetarium Projector and the 10-inch Siderostat-type Refractor Telescope were nearly sold to Navarro College in central Texas in 1995, simply for display as antique equipment; there was no plan to actually use this historic equipment. The Council of the City of Pittsburgh wisely chose to keep this historic equipment in Pittsburgh; the original Buhl Planetarium building, property, equipment, and artifacts are the property of the City of Pittsburgh. The Pittsburgh Children's Museum, located across the street from the original Buhl Planetarium building[in the 1897 Old Allegheny Post Office building], has presented a proposal to use the original Buhl Planetarium building as part of an expanded Children's Museum/Center. However, currently, the Pittsburgh Children's Museum's proposal does not include retention of the historic equipment or other artifacts remaining in the original Buhl Planetarium building. Dismantling of the historic Zeiss II Planetarium Projector and the 10-inch Siderostat-type Refractor Telescope will result, if the current Pittsburgh Children's Museum and Center proposal proceeds without modification. Although there is a proposal for reassembly of this equipment at The Carnegie Science Center, the author seriously doubts that the Science Center would actually spend nearly one million dollars to make this equipment functional, once again--particularly considering that the Science Center currently has state-of-the-art planetarium and observatory equipment. Hence, under this proposal, if there is any reassembly of the equipment, they would be reassembled as non-functioning, antique artifacts. Considering that this equipment does function in its original installation, where they are currently located, the disassembly and possible reassembly of non-functioning artifacts would seriously degrade the historic value of this equipment. This historic equipment was custom-built for use in the original Buhl Planetarium building. These two pieces of equipment could not be used elsewhere without duplicating the original Planetarium Theater and the original Astronomical Observatory at a cost of nearly one million dollars. The author has formed an organization, named " Friends of the Zeiss", to work to preserve the historic Zeiss II Planetarium Projector, 10-inch Siderostat-type Refractor Telescope, and other artifacts such as the Mercator's Projection Map of the World(largest map in the world when created for the 1939 World's Fair in New York City), and the Nat Youngblood mural on the history of steel technology(commissioned by the U.S. Steel Corporation) in the original Buhl Planetarium and Institute of Popular Science building, located in Allegheny Center on Pittsburgh's Lower North Side. The original name of this organization, "The People's Planetarium and Observatory", was derived from the historic name of Buhl Planetarium's original Astronomical Observatory, "The People's Observatory". For simplicty, the name was changed to Friends of the Zeiss. For legal reasons, it was decided not to include the word "Buhl" in the name of this new organization. The author has told Pittsburgh City Council that a not-for-profit organization, with 501(c)(3) IRS tax-exempt status, will be formed, to raise funds to maintain these pieces of historic equipment and artifacts, if they remain in the Buhl Planetarium building; the tax-exempt status of Friends of the Zeiss is pending. Click here for mission and organizational information about Friends of the Zeiss. Friends of the Zeiss is currently working to convince Children's Museum and City officials that retention and funtionality of the historic Zeiss II Planetarium Projector and the 10-inch Siderostat-type Refractor Telescope, in the original Buhl Planetarium building, will complement the proposed Pittsburgh Children's Museum and Center. Another group working to preserve The Buhl Planetarium and Institute of Popular Science is called "Save the Buhl". Click here to read a brief history of The Buhl Planetarium and Institute of Popular Science. Or click here to go straight to the web site's Master Index. The author of this Internet, World Wide Web Site is Glenn A. Walsh, a free-lance writer and Internet web page designer in Pittsburgh, Pennsylvania U.S.A. Mr. Walsh received a B.A. in Journalism, with emphasis in Urban Affairs (Honors Program, Phi Eta Sigma, Phi Beta Kappa), from the University of Kentucky in 1978. Mr. Walsh graduated from the Shaler Area High School in 1974, in the Pittsburgh suburb of Shaler Township, where he was a member of the National Honor Society. Mr. Walsh heads a new not-for-profit organization, Friends of the Zeiss; he serves as Project Director and on the Steering Committee of the organization. This organization seeks to preserve the functionality of the historic equipment and artifacts of a pioneer in the history of the development of planetaria and museums of the physical sciences, Pittsburgh's Buhl Planetarium and Institute of Popular Science, including the Zeiss II Planetarium Projector, now the oldest operable major planetarium projector in the world ! Mr. Walsh has participated in informal science education since 1972, and he has nearly twenty years of professional experience in the planetarium, museum, and public library fields. Much of this experience was with Carnegie Museums and Carnegie Libraries in the Pittsburgh region, where industrialist and philanthropist Andrew Carnegie amassed his fortune in the steel industry. Mr. Walsh is a noted authority on the life of Andrew Carnegie and the history of the libraries and museums he founded. Mr. Walsh authors an Internet web site on the History of Andrew Carnegie and Carnegie Libraries at URL: < http://www.andrewcarnegie.cc >. Mr. Walsh also served as the Consulting Editor of the 1999 April issue ( Link 1 *** Link 2) of Cobblestone magazine; the theme of this particular issue was the life and philanthropies of Andrew Carnegie. Cobblestone Magazine is a national history magazine for children in the United States, published in Peterborough, New Hampshire. Mr. Walsh served as a Life Trustee on the Board of Trustees of the Andrew Carnegie Free Library and Music Hall of Carnegie, Pennsylvania (a suburb just southwest of the City of Pittsburgh) from 1995 April 20 (96th anniversary of the legal founding of the Library by Andrew Carnegie) through 2000 June 6. He served one year as the Library Board's Treasurer and two years as the Board's Secretary, and he served as the Library's Historian. He managed the Library's annual Summer Reading Program for young people, in the Summer of 1995, and he taught a monthly, one-day, "Introduction to the Internet" class for library patrons, from 1996 through 2001. Mr. Walsh also coordinated the weekly tours of the Library's Civil War Museum, The Captain Thomas Espy Post, Number 153, Grand Army of the Republic. Mr. Walsh was employed in several capacities with a pioneer in the history of the development of planetaria and museums of the physical sciences, The Buhl Planetarium and Institute of Popular Science in Pittsburgh (a.k.a. Buhl Science Center) and its successor, The Carnegie Science Center, from June of 1982 through January of 1992. Among the several positions Mr. Walsh held during this time span were Astronomical Observatory Coordinator (five years); Planetarium Lecturer (three years); and Curator of the "BioCorner" Embryology Exhibit (a Life Sciences exhibit which Mr. Walsh created in 1983 for Buhl Planetarium, at the request of the then-new Buhl President, Joshua C. Whetzel, Jr.), which included the hatching of chicks (and occasionally ducklings) in public view every weekend (and during major holiday periods) year-round (four years). He taught a chicken embryology class in the Summer of 1984. On 1987 January 1, the Buhl Science Center merged with The Carnegie Institute to become one of The Carnegie Museums of Pittsburgh. A new Carnegie Science Center [constructed on the north bank (i.e. North Shore) of the Ohio River], located one mile southwest of the Buhl Planetarium building, replaced the Buhl Science Center on 1991 October 5. During high school and college years, Mr. Walsh served as General Manager of an educational radio station ( WLCR-AM Carrier Current), operated by Camp Shaw-Mi-Del-Eca in the Lewisburg/ White Sulphur Springs, West Virginia area, while also employed as a Camp Counselor during the Summers of 1972 through 1977. Mr. Walsh was granted a Third Class Commercial Radiotelephone License with Broadcast Endorsement, by the Federal Communications Commission (FCC), in March of 1972. Mr. Walsh was the instructor for a radio course, which taught FCC regulations and radio theory necessary for the acquisition of a Third Class Commercial Radiotelephone License with Broadcast Endorsement. In addition to teaching this course to interested campers at Camp Shaw-Mi-Del-Eca during the camping season, he also taught this course as part of a leisure learning program at the University of Kentucky in 1975. Several campers at Camp Shaw-Mi-Del-Eca did take this course and subsequently succeeded in passing the FCC examination for a Third Class "ticket" (Note: The FCC no longer offers Third Class radio licenses.). Note: SPRPC is now known as the Southwestern Pennsylvania Commission (SPC). Mr. Walsh delivered an invited address, before the Great Lakes Planetarium Association on 2001 October 13, regarding the history of The Buhl Planetarum and Institute of Popular Science, a pioneer in the history of the development of planetaria and museums of the physical sciences. Mr. Walsh organized the celebration of the centennial of the dedication of the Andrew Carnegie Free Library and Music Hall, including delivery of the address on the history of the Library, on 2002 October 8. Mr. Walsh participated in a three-person panel for the Carnegie Libraries: Challenges and Solutions educational session at the 2006 National Preservation Conference in Pittsburgh, sponsored annually by the National Trust for Historic Preservation and locally (2006) sponsored by the Pittsburgh History and Landmarks Foundation. Mr. Walsh's presentation was titled, "Primary Impediments to Historic Preservation: EGO and MONEY !" Mr. Walsh authored articles, regarding three historic Pittsburgh astronomers (John A. Brashear, Samuel Pierpont Langley, and James E. Keeler), for The Biographical Encyclopedia of Astronomers published in 2007. Mr. Walsh contributed the article, "How We Learn about the Universe," in the May/June 2008 issue (page 18 of the 28-page issue) of the new Spigot Science Magazine, an exciting, new, on-line science magazine for young people and classrooms - grades 4 through 7; the theme of this issue was "The Universe." A subscription to this new Internet resource is easy and free-of-charge, and the subscription provides access to all past issues. Mr. Walsh created and manages several educational web sites on the Internet. He also created the web site of The Duquesne Incline of Pittsburgh; this web site was originally hosted, for educational purposes, on the domain of The Carnegie Library of Pittsburgh, through their Carnegie Library Community Network/Three Rivers Free-Net, in association with the Electronic Information Network For Public Libraries in Allegheny County. The Internet web sites of The Duquesne Incline and the historic Transit of the Planet Venus Across the Image of the Sun on 2004 June 8 (adjoining the Friends of the Zeiss web site) are hosted for educational, non-commercial purposes by the new Pittsburgh Free.Net. protected by the Historic Review Commission of Pittsburgh. Planetarium Projector in the World ! * Biography: Henry Buhl, Jr.
* Excerpts from the Last Will and Testament of Henry Buhl, Jr.
Second largest Siderostat-type telesscope in the world! * Christopher J. Bonar, VMD, Associate Veterinarian, Cleveland Metroparks Zoo: Former Buhl director Carl Wapiennik was very kind to me as a teenager in the early 1980's. He let me review the file on the Tesla coil in the Board Room when I was researching it to build a similar one. Because of this interaction, I was able to write to and talk by phone with Buhl Tesla coil builder George A. Kaufmann. He was 88 years old, but still very sharp. With his advice, I was able to build a similar coil, and am still a Tesla enthusiast. I later studied biology at Harvard University and received my V.M.D. from the University of Pennsylvania. Several of my fellow Pittsburghers who were science majors also learned a lot at the Buhl. It influenced generations of scientists....more than anyone realizes! * Thomas Bopp - Co-discoverer of Comet Hale-Bopp. A Youngstown, Ohio resident, who was inspired by visits to Pittsburgh's original Buhl Planetarium and Institute of Popular Science. * Benjamin Byrer, who painted seven large astronomical murals for Buhl Planetarium's Hall of the Universe. * David E. Chesebrough, Ed.D. - President and Chief Executive Officer, Center of Science and Industry, Columbus, Ohio; also see Buhl Exhibits Staff from the late 1980s. Assistant Director of the Allegheny Square Annex (name given to original Buhl Planetarium building, 1991 to 1994), The Carnegie Science Center, tutorial center where Carnegie Science Center Science and Computer classes (including Astronomy classes in the original Buhl Planetaarium Theater of the Stars and Observatory) were taught, until February of 1994 when the classes were consolidated into the new Science Center building and the Buhl Planetarium building was abandoned (1991 to 1994). * James B. Irwin - Eighth man to walk on the Moon! * George A. Kaufmann, builder of Buhl Planetarium's 1,200,000-volt Oudin-type Tesla Coil. * Jim Krenn - Long-time (since 1988) morning radio personality on WDVE-FM 102.5 MegaHertz; formerly Tour Guide (Floor Aide) at Buhl Planetarium. * Clark McClelland - Former Astronomy instructor at Buhl Planetarium; Mr. McClelland's web site: Stargate Chronicles. * Herman Mike - Served on the Maintenance staff of Buhl Planetarium from 1958 to 1991, after the closure of Boggs and Buhl Department Store, where he was employed in a similar capacity. * James J. Mullaney - Started teaching at original Buhl Planetarium and Institute of Popular Science and observing at the University of Pittsburgh's Allegheny Observatory at age 16! By the late 1960s and early 1970s he was Curator of Exhibits and Astronomy at Buhl Planetarium and Staff Astronomer at Allegheny Observatory. Also see radio interview and 1970 eclipse. * Paul Oles (Olejniczak) - Third Buhl Planetarium Director (1967 to 1991). * Martin Ratcliffe - Fourth Buhl Planetarium Director (1991). * Paul M. Ricker - Assistant Professor of Astronomy at the University of Illinois and a Research Scientist at the National Center for Supercomputing Applications (NCSA). Formerly a student volunteer for the Astronomical Observatory at the original Buhl Planetarium. * Gwen (Jennifer Katherine) Roolf - 1984 Buhl Planetarium youth volunteer, who participated in research with the California and Carnegie Planet Search Project in 2005. * Leo J. Scanlon - Co-Founder of Amateur Astronomers' Association of Pittsburgh; One of first two Buhl Planetarium Lecturers (the other was Allegheny Observatory Director Nicholas E. Wagman) * Garth E. Schafer - Computer Learning Lab Volunteer and later Manager (1984 to 1991). * Carl F. Wapiennik, retired in 1983 as Vice President, Operations, of then-newly renamed Buhl Science Center. * Nicholas E. Wagman - One of the first two Buhl Planetarium Lecturers (the other was Amateur Astronomers' Association of Pittsburgh Co-founder Leo J. Scanlon) when Buhl Planetarium opened in 1939; at the time he was Director of the Allegheny Observatory. * Joseph Yeager, Ph.D. - Chairman of Sommer Consulting, Inc., a licensed psychologist, a venture capitalist, a Diplomate of the American College of Forensic Examiners (ACFE) and a national board member of the ACFE division, the American Board of Law Enforcement Experts (ABLEE). Dr. Yeager credits his career choice to the original Buhl Planetarium and lectures by long-time Planetarium Director Arthur Draper. * Madame Maria Sklodowska Curie - A Polish Scientist; Discoverer of Elements Radium and Polonium. * Jeremiah Dixon - Surveyor and Astronomer, who with fellow Englishman Charles Mason (Astronomer and acquaintance of Benjamin Franklin) surveyed the famous Mason-Dixon Line, 1763-1767, as the official boundary line between the English colonies of Pennsylvania and Maryland--as well as a small portion of the line eventually forming the official boundary between the American states of Pennsylvania and Virginia (now West Virginia), and an extension of this line to the Ohio River forming the boundary between Marshall and Wetzel Counties in present-day West Virginia. * Benjamin Franklin - Famous author, printer, scientist, inventor, politician, diplomat, nation's first Postmaster General, and one of the leading founders of the United States of America. He was an acquaintance of English Astronomer Charles Mason who surveyed the Mason-Dixon Line. * Edmond Halley - English Astronomer who first calcuated orbit of Halley's Comet. The Astronomical Observatory of Pittsburgh's original Buhl Planetarium provided special observing nights for the public to view Halley's Comet during the apparition of Autumn, 1985 through Spring,, 1986. In addition to Buhl Planetarium's primary telescope, the 10-inch Siderostat-type Refractor Telescope, a 13-inch Dobsonian Reflector Telescope was also purchased for the "Halley Watch" program and used on the east and west outdoor wings of the Observatory. On certain evenings, people stood in line, in the first floor's Great Hall, for more than an hour to have the opportunity to view Halley's Comet through one of Buhl Planetarium's telescopes. As the 1985-1986 apparition of Halley's Comet did not come as close to Earth as did the 1910 apparition [when John Brashear hosted telescope observing of Halley's Comet at the new Allegheny Observatory], Buhl Planetarium could not guarentee how good a view could be seen through the telescopes by the public, and hence, only charged one dollar for the Comet viewing. Although, at this time, Buhl Planetarium's third floor Observatory was not accessible to wheelchairs [visitors had to climb steps to reach the second and third floors], on a couple occasions when a wheelchair patron wished to view the Comet, several staff members and volunteers simply carried the patron, wheelchair and all, up the steps to the Observatory. Regular weekly, evening public observing sessions [every Friday evening (7:30 p.m. to 10:30 p.m., following the 7:00 p.m. planetarium show), weather-permitting, year-round] in Buhl Planetarium's Observatory were restored about a month [1986 June 13] following the conclusion of the "Halley Watch." * Elisabetha Hevelius - Wife and observatory assistant of Johannes Hevelius: Bio *** Classic Buhl Planetarium Astronomy exhibit "Observatory of Hevelius" * Johannes Hevelius - 17th century Astronomer; husband of Elisabetha: Bio *** Classic Buhl Planetarium Astronomy exhibit "Observatory of Hevelius" * James Edward Keeler - Director of Allegheny Observatory (1891); Pioneered Astronomical Spectroscopy * Sameuel Pierpont Langley - Director of Allegheny Observatory (1867); Secretary of Smithsonian Institution (1887) Developed new science of Astrophysics; pioneered heavier-than-air motorized flight * Charles Mason - Astronomer, an acquaintance of Benjamin Franklin, who with fellow Englishman Jeremiah Dixon surveyed the famous Mason-Dixon Line, 1763-1767, as the official boundary line between the English colonies of Pennsylvania and Maryland--as well as a small portion of the line eventually forming the official boundary between the American states of Pennsylvania and Virginia (now West Virginia), and an extension of this line to the Ohio River forming the boundary between Marshall and Wetzel Counties in present-day West Virginia. * David Rittenhouse - Renowned American Astronomer and Surveyor, from Philadelphia, who completed the survey of the Mason-Dixon Line in 1784, to the now-existing southwest corner of the Commonwealth of Pennsylvania (problems with area Indians had prevented Charles Mason and Jeremiah Dixon from completing the survey in 1767). Later surveyors extended this line to the Ohio River forming the boundary between Marshall and Wetzel Counties in present-day West Virginia. * Tycho Brahe: Bio *** Classic Buhl Planetarium Astronomy exhibit "Tycho Brahe's Mural Quadrant"
of totality, at the Association for Research & Enlightenment (A.R.E. ), 215 67th Street in Virginia Beach, Virginia. * CBS-TV, televised in black-and-white from Florida * 1972 July 10 - Eclipse of the Sun - White Sulphur Springs WV: Partial Eclipse Radio reception experiment during Eclipse of Sun. Anecdote: Eclipse mentioned in popular song before event! * 1975 April 2 - Dyke, Barb V., et.al. "Saturn Through the Buhl Planetarium Heliostat." * 1991 July 11 - Eclipse of the Sun - Pittsburgh: Partial Eclipse Radio reception experiment during Eclipse of Sun. News article from the 1991 July 11 issue of the Pittsburgh Tribune-Review * 1994 May 10 - Eclipse of the Sun - Northeast, Erie County PA (Mercyhurst College Observatory): Annular Eclipse Observed by Glenn A. Walsh and John D. Weinhold. Fourth library constructed and endowed by Andrew Carnegie. Antique Telescope Society and information regarding the Society's September, 2001 Convention in Pittsburgh. Including oldest, operable major planetarium projector in the world ! Including second largest Siderostat-type telescope. History of the Great Miniature Railroad and Village of The Buhl Planetarium and Institute of Popular Science, Pgh. Your Use of Museum's Web Portal, for Searches, Helps Raise Funds for Museum--At NO COST To You! This Internet Web Site originally created 1999 September 5; moved to Lycos' Tripod.com domain 2000 August 8. Last modified : Tuesday, 10-Nov-2009 17:53:22 EST. You are visitor number , to this web page, since 2000 August 8.